Cool air blowing from the top to the bottom provides a soothing effect on us rather than a stand or wall fan which would be blowing from across and diagonally onto our body. 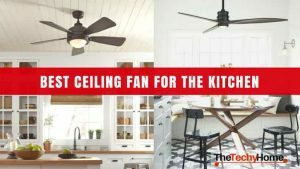 A ceiling fan would not be an encumbrance in any way, as it would be conveniently fixed onto the ceiling above and would not come in the way of furniture and other items on the floor. Only the constraint of fixing a ceiling fan should deter the idea, which could be the height of the ceiling from the floor. The ideal height of the ceiling from the floor should be a minimum of 10 feet, if you are to derive the full benefits of installing ceiling fans with light. Prior to purchasing ceiling fans with light it would be prudent to ensure there is ample space between the floor and the ceiling. It is imperative to have a minimum of two (02) feet between the blades of the ceiling fan and the ceiling if you are to enjoy optimum flow of air from the top and to a wide area at the bottom. The principle behind this theory is that a ceiling, wall or stand fan would pull air from the back of the fan blades and push it forwards or downwards as the case may be. In a ceiling fan it is the quantum of air between the ceiling and the blades of the fan that is pushed down by the blades. 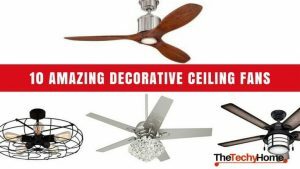 This is evident when you observe the blades of the ceiling fan or any other type of fan which are angled downwards, some facilitated with a ridge at the center of the blade. If the quantum of air is restricted and insufficient, between the blades and the ceiling the air that is blown down would be constrained too. Only the quantum of air constantly being trapped between the blades and ceiling when it is operating would be pushed down by the blades. When the gap between the ceiling and blades are restricted, the efficiency of the ceiling fans with light would drop drastically with less quantum of air being pushed down, by the blades. The height of a human could be averaged at 6 feet and when a standing adult outstretches both hands the reach could be around 7 &1/2 feet. 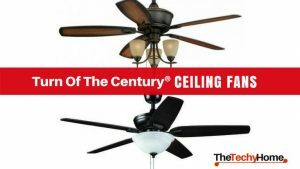 The ceiling fans with light should ideally drop down about 2 &1/2 feet or less from the ceiling which would compensate for the minimum 10 feet that is required to fix a one. A ceiling fan could add to the ambience of a room, additionally ceiling fans with light would bring a sense of style and beauty including light when you need it. 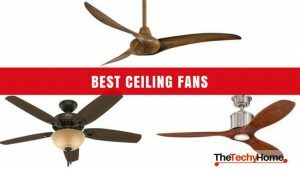 Hence it is imperative that you consider the above mentioned salient factors, before installing ceiling fans with light in your premises, if you are to derive the maximum benefit. This is an elegant, modernistic designed ceiling fan with good lighting, consisting of two 48 inch blades at a very stylish angle to add style and ambience to the room. Dual weather designed, one of the top selling ceiling fans enabling the two blades to be switched either clockwise or counter clockwise, to be comfortably warm or cool respectively. The lower ceiling clearance is compensated by the specially designed blades which pushes optimum airflow to a room of optimum area 144 square feet. 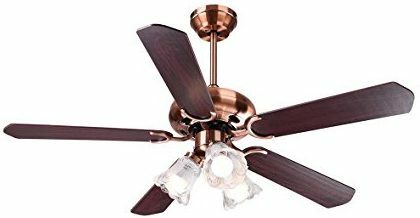 Stylishly design ceiling fan with light and remote with oil rubbed bronze finish with a white glass bowl that is frosted elegantly to accommodate 2×40 watts bulbs which are included. This five blade 48 inch, is one of the best ceiling fans with lights which add style and comfort when needed and provide efficient performance in medium to large sized rooms. 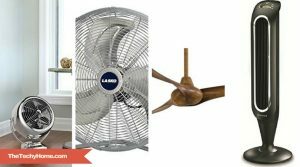 Reversible fan blades for warm and cold weather use, with three speed ceiling fan with remote control. The best ceiling fan with light and remote which offers very powerful downward air movement for optimum comfort in any weather. The five dark or medium walnut dual weather reversible 52 inch blades are quiet in operation and stylish in design adding to the ambience of any room. If you are looking for ceiling fans with good lighting this is just what you would want as it is designed with 3 x 60 watts Candelabra incandescent light bulbs which are included. The five 48 inches elegantly designed antique finished blades would deliver efficient and comfortable air flow in and with the option of a longer down rod, air flow could be increased. Customized for optimum comfort in any weather this ceiling fan with remote is available in elegant colors to suit any décor and add to the stylish interior. Three frosted glass shades makes it the best ceiling fan with good lighting which would bring about a bright light filled room wherever it would be installed. 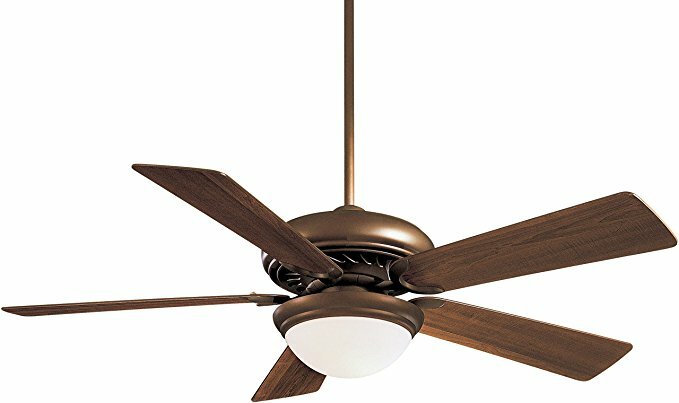 One of the best ceiling fans with lights designed with five 52 inch blades in brown with an elegantly designed frosted dome which would bathe any room with ample light. It provides efficient airflow with its powerful but super quiet 62 watts motor which would leave you comfortable in any weather conditions. This is one of the top selling ceiling fans which is traditional in style and design bringing a special blend of antique and modern living style wherever you may install it. 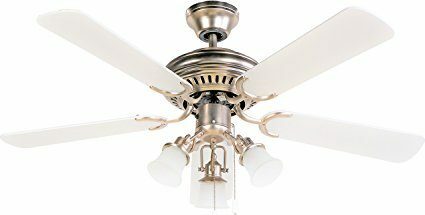 Elegantly designed in an antique finish this is the best ceiling fan with light and remote with five blades with three mounting options for flush, down rod and sloped ceilings. The stain wood finish would add an superlative elegance to any room whilst the comfort of the remote control would add convenience. The powerful but smooth motor is reversible for dual weather conditions offering total comfort all through the year. If you are contemplating of buying a ceiling fan with light and remote this is just the one for you as it has style, convenience and aesthetic value too. 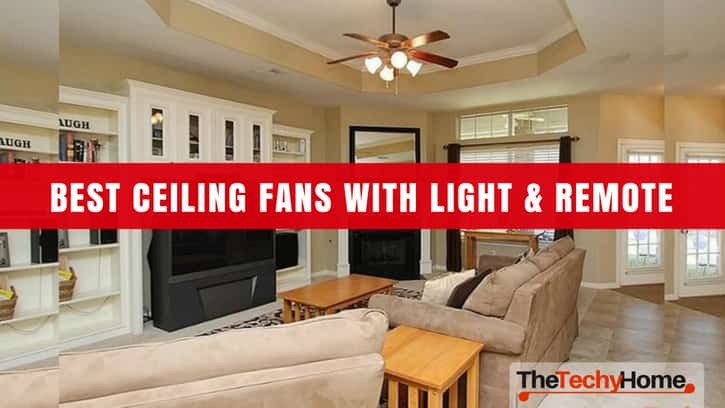 There are only a few ceiling fans with good lighting which means that the dispersed light is subtle and diffused to bring about an elegance all over the room. This is five blades with 52 inches of comfort in any weather condition and is remote controlled so that you could operate from being seated in your favorite lounging chair. It is very simple in design and would be ideal for a very simple room like an office or such place. This s the best ceiling fan with light and remote which ideal to install in any type of room and would be efficient and deliver optimum comfort in operation. ©2018 The TechyHome All Rights Reserved.